For the romantic full-figured woman with classic sensibility and vintage taste, getting married in an antique lace dress is the ultimate fantasy. This dream can be fulfilled more easily than you think, either with good luck in vintage shops, finding a sewing professional who can work with an old dress or never-used fabric or locating a modern dress that reflects times gone by. If you love the look of antique lace, don't settle for anything less. 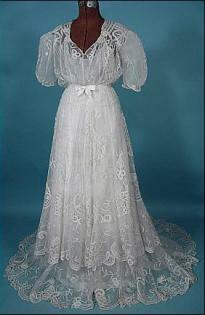 Lace was a very popular fabric for wedding clothes from the early 19th century and through the 1920s. During the Great Depression, it was too expensive for most people to indulge in, and the intricate work involved in making good lace was not something anyone could undertake during World War I. 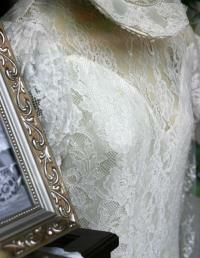 However, in the early years of the 20th century, lace was very commonly seen on day dresses and wedding wear. Many of these clothes were well-preserved and so can be found in high-end vintage shops. The good news for the plus sized woman is that the average woman at that time was larger than is the style today, so many of the antique dresses you find are likely to fit. You must bear in mind, however, that the women of the day wore heavy foundation garments so that the dress would hang properly. An Edwardian dress can be very flattering, especially to an apple shape, but you will have to wear a corset so that it will look right. Dorris Wedding - The website offers a bevy of antiques styles with classic laces, and all their dresses are made from scratch. You'll find gowns in nearly every cut and outline in sizes up to 26W. The company doesn't offer layaways, so the dress must be paid for before any alterations or delivery takes place. They also have a very limited return policy that depends on several variables in your order, so read their policy carefully before placing an order. Antique & Vintage Dress Gallery - This online store is owned by an antique clothing collector and carries an impressive inventory of vintage wedding gowns featuring antique lace. They allow layaway although items held for seven days or longer or placed on layaway cannot be returned. Other items can be returned if they cost more than $150. As with the other store, shipping costs aren't refundable. You may find exactly what you want on one of these sites the first time you look, but chances are that you may have to keep checking back frequently, as well as explore other options. Inventory changes quickly; new styles are added frequently, and once a dress is purchased, there is no guarantee that a similar piece will become available. Once you know what you want, you may be happier with a dress that is purely a reproduction, in which case look at The Faded Sunflower, a company that creates beautiful replicas, knows how to do them in plus sizes, and makes good use of lace, all for startlingly low prices. You can also work with Tulle and Chantilly, an online custom dress boutique that has experience with lace dresses and plus sizes. Antique lace doesn't necessarily refer to fabric or dresses that are more than a century old. The term also refers to modern lace in a color and style that looks like hand-tatted lace of yore. This can be preferable in a good dress, because it's a lot less likely to shred. Or, if it does, you're a lot less likely to lose your sanity when that happens! Especially if this is your wedding dress, you have enough to worry about while wearing it without protecting something so delicate. Wtoo's Luisa gown, an A-line gown with cascading layers of lace and a romantic sweetheart neckline. Available from size 00-32W. The Cap Sleeve Lace over Satin gown by David's Bridal, for the more modest, old-fashioned bride. This dress has a flattering empire waist, cap sleeves, and a stunning lace back with button details. From 14W to 26W, and in 14P and 16P. To actually sew an antique lace plus size dress, you need to be an experienced seamstress. However, you can design your own dress and have someone trim it with lace that you find on eBay, or at any vintage shop. It can be easier to find vintage textiles in good condition than to find the perfect (and perfectly fitting) dress itself. If you find a few yards of antique lace, the tailor with whom you're working to fit your wedding dress should be able to integrate it into your gown. It may be enough for your veil and train, with a bit left over to add as detailing on the bodice. Wind a bit of lace around your bouquet and you will be an old-fashioned vision with a modern sensibility! Sweet, timeless lace is available to women of every shape and size. Whether you make it yourself or buy it at a vintage shop, you'll look your romantic best on your big day.